The system I’m about to describe does not reside in my home but rather at my father-in-law’s. Still, I know this system exceedingly well. As it happens, the source is a Sony CDP-C69 ES-series CD player – a player of solid enough performance that frankly never impressed me either way as anything special, though it has always done its job. And at the other end of the chain is a pair of Ohm Walsh 300 Mk II loudspeakers ($3995-$4495 depending on finish). 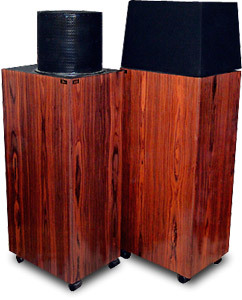 The Ohms did at one time inhabit my home, but they eventually gave way to newer and more exciting speakers. As a result, my father-in-law is the very happy beneficiary of my fetish for the new. The Ohm speakers are a large, essentially one-way speaker (not really, but I’ll expand on that below) utilizing a 12” driver (what Ohm calls a CLS driver: a direct descendant of the late Lincoln Walsh’s Walsh driver), which is something of a cone that fires down into the cabinet from the top. The sound radiates into the room off the back of the cone, and it does so with a 360-degree radiation pattern. I refer to the speaker as essentially a one-way system because while it does include a super-tweeter, its effects are not heard until around 10kHz, which is well above most musical fundamentals. One of the speaker’s strengths has always been soundstaging. This omnidirectional speaker throws a huge (albeit somewhat limited in the vertical plane) and holographic soundstage that is easily heard from an extraordinarily wide sweet spot. Another of the speaker’s strengths is bass. The speaker can pound out the bass notes, even in the very largest of rooms, and it plays very loudly without strain too. Top-to-bottom coherence is very good, as one would expect. The speaker’s shortcomings have always been what one seeks from the very highest of the high end. Though soundstaging is excellent, image delineation has always been somewhat limited. As coherent as the 300 Mk II is, midrange detail, particularly inner-detail, has been somewhat blurred, which lends the speaker a somewhat distant perspective that has somehow always made sonic sense – this is not an in-your-face speaker, which is one of the things that makes it so endearing to so many people. Though in possession of great bass power, the Ohm has never impressed me as being quite as tight or as detailed as I wish it were. Don’t misunderstand me – the 300 Mk II is in no way flabby or loose; it just lacks the taut detail wrought from a good, well-placed subwoofer. Lastly, microdynamics have never been this speaker’s forte. One can reasonably assume (as I did) that a 12” dynamic driver capable of such dramatic bass and macrodynamics will be limited in its ability to start and stop fast enough so that the speaker is able to capture the most minute of dynamic textures. It’s important to understand that these have been the consistent impressions of the Ohm Walsh 300 Mk IIs as observed with many power amplifiers, both tubed and solid state, and of varying power. 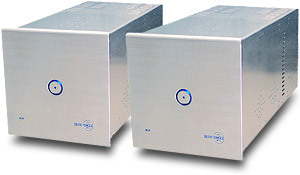 But that was all before they met the Blue Circle BC8s mono amplifiers ($6950 per pair), which have completely redefined the capabilities of the Walsh 300 Mk IIs for me. During the review process of the Blue Circle BC8 (full review forthcoming), I matched these amps with a variety of speakers residing under my roof, but all of these speakers are of the easy-to-drive sort. Wanting to match the amps with a speaker more in need of their high current and 225Wpc, I packed them up with my Herron VTSP-1A linestage and headed off for a rendezvous with the Ohms. While I had never used the Herron in this system before, I have indeed substituted other quality preamps before, and I am satisfied that the preponderance of what I’m about to describe is attributable directly to the Blue Circle power amplifiers (at the very least, the BC8s finally allowed the fine attributes of a quality preamp to come shining through). The inexpensive interconnects used were from AudioQuest. Speaker wire was basic Monster Cable. No power conditioning was used, and everything was plugged into a power strip, which was plugged into a non-dedicated circuit. In other words, this was a straightforward setup with multiple opportunities for tweaking, if one so desired – which we didn’t. After a brief 20-minute warm-up, during which time the speakers sounded just about as I’d always known them to sound, the system suddenly sprung to life as I had never known it to do before. The most dramatic change was also the most predictable one (though I’d have to say that after past experience, I was still hoping for it, rather than predicting it). What I speak of is the bass presentation. The Blue Circle amps took hold of the Ohms in a way that no amplifier ever has done before. Bass was now visceral in its intensity, and detail increased immensely. It was as if someone sneaked into the room and installed a very large and powerful subwoofer into a pre-determined and expertly chosen location while I sat listening with my eyes shut tight. I’m talking not about a refinement of the bass, but a complete overhaul. Bass power aside, what I was hearing had nothing in common with what I had experienced from these speakers previously – there was much more. The infamous Ohm Walsh soundstage was now fleshed out in the vertical plane too, and the sense of space and air now extended almost as much in the vertical as it had always done in the horizontal. The Blue Circle amps were also responsible for a heretofore unheard-of focusing of the instrumental outlines and a layering of images with a more palpable sense of measurable soundstage depth. The Ohms have always excelled at presenting a deep soundstage, but now I could hear graduations of that depth as never before. Finally, what was perhaps the most flabbergasting of all was that of microdynamic management. I’ve heard a lot of fine speakers in a lot of fine systems that fell on their faces where microdynamics are concerned. Unfortunately, once you experience a system with good microdynamics, you never forget it. In my estimation, microdynamics are one of the last barriers to really great sound. They give life and rhythm to even the most subdued and simple of compositions, and the Blue Circle/Ohm system now had them in spades. Lest you think that I exaggerate any of my claims for what the Blue Circles brought to the table, you should know that my usually stoic father-in-law was absolutely giddy. He sat in the sweet-spot chuckling to himself about what he was hearing, and just last night he told me that he was now spoiled for what he had heard that day. If only that little mind-erasing gizmo from Men In Black were available to me I could return him to his previously blissful state. Some could argue the virtues of combining a $4000 pair of speakers with $7000 worth of power amplification. I would argue back that dollar for dollar, this was one of the best, stunningly full-range amplifier/speaker combinations I have heard at anywhere near its price. It also illustrates just how important the amplifier/speaker combination really is. And what blows my mind is the possibility of what could be with the addition of a top-drawer front-end and some attention to system peripherals (perhaps even some tweaking too!). And that is what system building is all about.